I love Jazz and the era that gave birth to it. As mentioned previously on this site, I have a nice little collection of 78s and long to one day collect jazz sheet music. I have been fortunate to find a few Marion Harris records, and in pretty good condition. For those who are unaware, I thought I would give a little background about Marion Harris (born Mary Ellen Harrison in 1896 - I think everyone changed their names back then) a well-known and popular singer of jazz and blues in the 1910s to the 1930s. She introduced and popularized many standards, such as "After You've Gone", "A Good Man Is Hard to Find”, "I Ain't Got Nobody”, “I’m Nobody’s Baby”, “The Man I Love”, “It Had To Be You”, and “Tea For Two,” to name a few. Harris started off in Vaudeville, but soon was discovered by Vernon Castle and debuted on Broadway in “Stop! Look! Listen.” She would go on to perform in “Yours Truly” and “A Night in Spain.” She recorded under three labels in her career: Victor (1916-1919), Columbia (1920-1922), and Brunswick (1922-1930), and Columbia again (this time in London, from 1931-1934). During her stint in London she performed with the Isham Jones Orchestra and had a stint at Cafe de Paris. In the 1930s she also performed on radio programs for both NBC and BBC. Her film credits include Devil-May-Care and Trouble Ahead. Unfortunately, her luck took a turn in the 1940s. Her and her husband’s (a theatrical agent) house in London was destroyed by the Germans. Harris was diagnosed with a neurological disorder. On April 23, 1994, after she was discharged from her treatment in New York, she died in a hotel fire (Hotel Le Marquis, 12 East Thirty-first Street in New York). The fire was actually started by Harris herself, after she fell asleep smoking in bed. She was 48 years old. In a career spanning over twenty years, Harris left us with some wonderful music (as listed above). 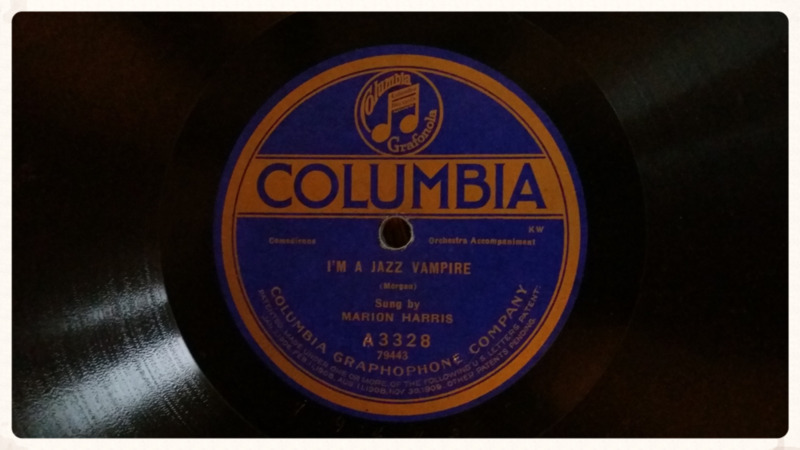 Today, I want to introduce to a little gem by Marion Harris titled "I’m a Jazz Vampire" (the follow-up to Harris’ hit "Jazz Baby"). It is like a musical sequel. Harris sings "Jazz Baby" and "Jazz Vampire" identically). No, it is not at all about vampires. However, if Les Vampires ( a 1915–16 French silent serial film Louis Feuillade, where a reporter and his loyal friend battle a bizarre gang of criminals called The Vampires) popped into your head, you get mega bonus points. Interestingly, the term vampire was also thrown about to describe women with red hair. Babe Egan’s Hollywood Red Heads (an all-girl orchestra) was billed as the Twelve Vampires. Thank Ken Burns and his wonderful documentary Jazz for that little tid-bit. Vampire in the context of "I'm a Jazz Vampire" refers to the 1920s slang term, Vamp, meaning an aggressive flirt. Think Theda Bara, whose femme fatale roles led to the nickname The Vamp (she actually grew frustrated being typecast as The Vamp / Vampire - femme fatale). This was the type of woman Marion was singing about in "I’m a Jazz Vampire." Say I'm the only little bird who doesn't go to rest. For I'm a jazz vampire. For I am all the evil music has. Shook my shoulders and the sun went down. For I'm the meanest kind of jazz vampire. I'm the wicked vampire of the jazz"
Staying up all night after the sun sets. Adjective such as wicked, mean, and evil self-described. There, of course, is much more to the song - the music that enchants her, the work she pushes through to enjoy her night. I hope you will listen and enjoy it as much as me. I also hope it inspires you to listen to more music by Marion Harris. She had a wonderful voice and a great body of work. You can find many on the Internet Archive, or even YouTube. Please note, this recording is from my own record collection. My phonograph in action, as I recorded I'm a Jazz Vampire for your listening pleasure.